The Alzheimer's Art Quilt Initiative (AAQI) recenlty received its 12,000th donated quilt. Imagine 12,000 quilts. I have been following the Alzheimer's Quilt initiative for years. This is a truly remarkable effort. Ami Simms of Flint, Michigan is the founder and executive director of the AAQI, a 501(c)(3) nonprofit operated entirely by volunteers. She is a quilter, and her mother lived with Alzheimer's disease. The Alzheimer's Art Quilt Initiative (AAQI) recenlty received its 12,000th donated quilt. Imagine 12,000. 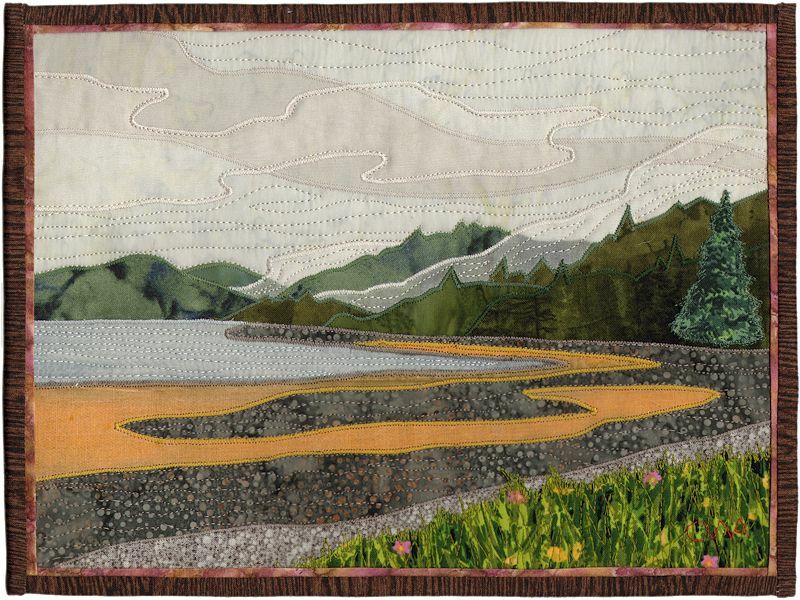 The 12,000th quilt made by multi-award winning quilter and teacher Charlotte Warr Andersen of Salt Lake City, Utah, is just one example of the efforts of this all-volunteer charity dedicated to raising awareness and funding Alzheimer's research through art. The Alzheimer's Art Quilt Initiative October 2012 Online Auction is running right now. To look at the quilts and to place a bid go here -- October 2012 Online Auction. You can see large images of the quilts on the website. Some really amazing art. If you live in Minnesota you can go see the quilts in person from October 5-7. Check out the details here -- Ecumen Detroit Lakes to Host "Alzheimer's Illustrated: From Heartbreak to Hope". The Alzheimer's Art Quilt Initiative® (www.AlzQuilts.org) is a national, grassroots charity whose mission is to raise awareness and fund research. The AAQI auctions and sells donated quilts, and sponsors a nationally touring exhibit of quilts about Alzheimer's. The AAQI has raised more than $763,000 since January 2006. It auctions and sells donated quilts through the Priority: Alzheimer's Quilt project and sponsors a touring exhibit of quilts about Alzheimer's called "Alzheimer's Illustrated: From Heartbreak to Hope." Ami Simms of Flint, Michigan is the founder and executive director of the AAQI, a 501(c)3 nonprofit corporation operated entirely by volunteers. She is a quilter. Her mother had Alzheimer's.